New Haven, a coastal city on the northern shore of Long Island Sound, is home to Yale University. The iconic places to run in New Haven include the Yale campus, East Rock, pretty residential streets, and a section of the Farmington Canal Heritage Trail. There’s also some great waterfront running as well. Though unfortunately cut off from central New Haven by the I-95/I-91 tangle, it’s wonderful once you’re there. New Haven Green and Yale Campus. New Haven was the first ‘planned city’ in America, and the 16-acre New Haven Green is a National Historical Landmark. 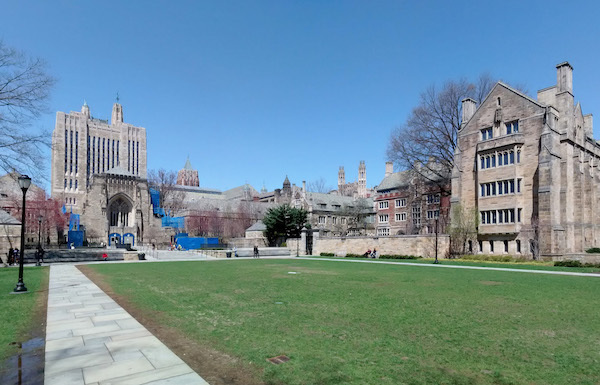 Cross College St. and run around the campus of Yale, which has fine running on numerous paths, bordered by Grove St. and Chapel St. Be sure to run Old Campus, Cross Campus, Beinecke Plaza, and Hillhouse. Overall, you can put together 3-4 miles here. For more, run down Whitney toward East Rock or the Farmington Canal Trail. Campus Map. East Rock. This is the running highlight of New Haven. A 2.5 mile switchback-ey road leads to the summit, which has great views. Total ascent is 750 feet, with some steep sections. Trail runners might venture onto some of the paths. East Rock is a little over 1 mile from Yale/New Haven Green (use Orange Ave. or Whitney Ave.). Route Map. Nice Streets & Neighborhoods. New Haven has some lovely streets with older Victorian homes and interesting architecture. A really nice area includes some of the roads from the Yale Campus heading east: Whitney, Hillhouse, Orange, Temple, Prospect, and side streets. We also love running in Hamden, an affluent suburb north of New Haven. Ridge Rd. is a nice straight shot that goes for miles, with gorgeous, set back homes. The quieter streets off Whitney Ave. are also good for running. Edgewood Park. Lovely park with a trail that’s ~1 mile from end-to-end. About 1.2 miles west of the Yale campus using Chapel St. or Edgewood Ave. The park also houses Yale’s athletic fields and the Yale Bowl stadium. A nice 4-5 miler! Front St. Just north, there’s also really nice waterfront running from Criscuolo Park north to Quinnipiac Terrace near I-91 in Fair Haven, mainly along Front St. It is possible to connect these two routes using Long Wharf Dr./East St./Chapel St., but it does go through an industrial section for ~1 mile (although there is a bike path). From New Haven center it’s 1.7 miles along Grand Ave. to get to Front St. See this MAP for the whole route, one-way. East Shore. There’s some great waterfront running in East Haven. We recommend the 3.4 miles from East Shore Park, south to Lighthouse Point Park. Combination of park trails, shore path, and road, with water views much of the way. It’s not one dedicated path — there are some road sections, so helpful to have this MAP of the route.